Our owner, Charles Guisinger has over 10 years experience creating beautiful stonework projects, both inside and outside and both residential and commercial. Prostone is proud to serve the Atlanta area as a masonry and hardscape stonework design and construction firm. Prostone is an "Angie's List" member in good standing. Mr. Guisinger serves on the planning/zoning committee for the City of Woodstock, and volunteers for Atlanta's Ability House, an organization that builds houses for low-income families in which one or more members have disabilities. We provide one-of-a-kind stonework creations that beautify your property and improve our lifestyle by increasing the enjoyment level you receive from your home or office. Whether you need an attractive yet functional retaining wall or a full outdoor kitchen, fireplace and patio we would love to meet with you to help you achieve your dreams. 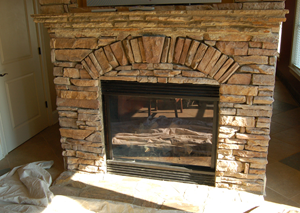 Our interior and exterior stonework craftsmanship is unsurpassed in the Atlanta area. Call today to get started building your dreamscape. We start by meeting with you at your property. This gives us a good chance to get to know each other. We will share with you some of the stonework creations we have completed that are in the same category of your desired project. If you are comfortable with what we can do for you, then we move forward with your project. We provide detailed start and finish dates, construction costs, assistance selecting the correct stone, constant communication during the construction phase, and a workmanship guarantee. Payment is only due as work is completed. Our goal is to exceed your expectations and deliver a result you will be proud of. Natural stone in your outdoor living spaceÂ adds beauty, durability and value to your landscape that you can enjoy forever. At Pro Stone we can design a custom stonework project that fits your lifestyle and budget. At Pro Stone we can design and install any shape or size wall, patio, or outdoor living space with the natural stone of your choice. We work with only the highest quality materials from the popular â€œTenneseeâ€ Fieldstone and Flagstone in many different colors, Bluestone, Granite and concrete pavers. The addition of stone on the exterior of your house increases the value, adds a formal, classic elegance and is extremely durable. There are many different ways to use stone from using it on a portion of a homeâ€™s exterior, or pairing it with siding and shingles. Introduce the natural look of stone to the interior of your house on a fireplace, bar or wall. ProStone installed a large flagstone patio and extended my retaining wall. It turned out great ( just like those I've envied on HGTV). Now I have my "outdoor oasis"! The crew was prompt, courteous and very hard-working - truly out to please the customer. I recommend them, and will use them for any future stonework I have done. We hired Prostone, Inc. to install a new concrete driveway and flagstone sidewalks. Charles, the owner, and his crew performed the work exactly as he stated he would in his quote. The entire job was handled very professionally, from beginning to end. The work exceeded my expectations. I would highly recommend Prostone, Inc., to anyone. Thank you Charles and Prostone, Inc. for making my dreams, become a reality. I hired Pro Stone to build stacked stone columns, walls, and a flagstone sidewalk. The project started and was completed on time. The finished product exceeded my expectations. The stonework is beautiful and I receive many compliments on it. Should I decide to have more stone work performed, I would readily hire Pro Stone to perform it. They are very professional, and I would recommend them to anyone. Call Us Today for Your Free Design Consultation!